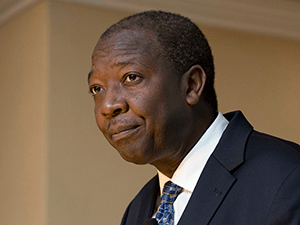 NORMAN Mbazima is to step down as CEO of Kumba Iron Ore in order to focus on the restructuring of the company as well as Anglo American’s coal business. Anglo owns about 70% of Kumba. The move signals efforts by the UK-listed group to give greater impetus to its strategic restructuring which could include using Kumba as a consolidatory force in South African mining. Mbazima will be replaced by Themba Mkhwanazi, currently head of AngloCoal whilst July Ndlovu, executive head of processing operations at Anglo American Platinum since 2007, will replace Mkhwanazi at the coal assets. The sale of the South African assets falls naturally to Mbazima as he is deputy chairman of Anglo’s South African unit whilst Mark Cutifani, CEO of Anglo, is chairman. Said Anglo: “Norman Mbazima will remain a member of the group management committee and will have oversight of the processes to restructure and divest Anglo American’s non-core assets in South Africa, including its interests in the Kumba and thermal coal businesses”. Mbazima leaves Kumba having steered the company through a restructuring programme in which the mining plan for its flagship Sishen mine in the Northern Cape province was profoundly altered and its Thabazimbi mine closed. All in all, Kumba’s reduced its total staff complement by 31%, equal to 1,500 full-time employees and 900 contractors. Speaking today in a media conference, Mbazima said the restructuring process was largely complete. There would be opportunity to expand production in the future, although the likelihood of reverting to the previous mine plan at Sishen – which worked on a larger pit shell – was not high as it involved re-employing staff. Posting its interim figures, Kumba said today that it had wiped out net debt of R4.6bn at the end of 2015 to a net cash position of R548m as of June 30. This was owing to an improvement in the iron ore price from about $31/t (currently trading at around $57/t), some R3.1bn savings in controllable costs, and a 61% reduction in capital expenditure to R1.3bn. Despite the price improvement, year-on-year prices were about $6/t lower which hit half-year earnings, partially offset by the 29% weakening in the rand against the dollar. On a normalised earnings basis, earnings for the six months were 4% lower at some R9.41/share (2015: R9.78/s) whilst attributable and headline earnings for the period were R9.30 and R9.41 per share respectively. Headline earnings increased by 20% to R3bn (2015: R2.5bn), mainly as a result of the de-recognition of a deferred tax asset of R617m in the first half of the previous financial year. The group did not declare a dividend. Commenting on its outlook for the remainder of the financial year, Kumba said it expected more stable operations and that full-year guided production of 12 million tonnes and 27 million tonnes was likely at Kolomela and Sishen mine respectively. However, the market would remain constrained. “The next year is likely to remain challenging; prices are not expected to recover in the short- to medium-term,” said Mbazima. Asked for his views on restructuring options for Kumba, Mbazima said proposals to either de-merge or sell Anglo American’s stake in the company remained on the table. “If you ask me about this in three months time, I will be able to give a more detailed report,” he said. “None of the options have been excluded; they are being evaluated,” he added. Citing Anglo’s Cutifani, Miningmx reported on July 12 that the group would consider a proposal to use its 70% stake in Kumba as a founding asset to create “a different type of entity”. “We haven’t made a final decision, but we can be flexible depending on how the [South African] government, major shareholders may want us to think about things. “So if a case is put to us, that maybe you could put two or three assets together and help create a different type of entity in South Africa, we’d be very open to that conversation,” he said. I like to commend Anglo for having taken the decision to replace the head of KIO Norman by Themba; and Themba by July. It makes me happy that the winds of change are blowing in South Africa. There were people in some quarters who where complaining about transformation, let’s them raised it that now. Themba and July are tried and tested engineers with remarkable record and bode well for transformation. Good luck gents. We know your capabilities and serve your company and country well.